Size of Baby (per “What To Expect”) – Size of an eggplant. Approximately two and a quarter pounds. Weight Gain – 16 pounds. Weight gain is back on track! The holidays certainly help. Movement – Lots of it. All day long. They say the baby should recognize my voice at this point. I’m sure that she also recognizes my daughter’s voice (and cry) as well. Sleep – Getting better. Let’s hope we follow that trend. A solid, uninterrupted 6 hours is all I can ask for. Even when my husband gets up in the middle of the night with my daughter, my mom instinct kicks in and I can feel her not sleeping. I am still restless. 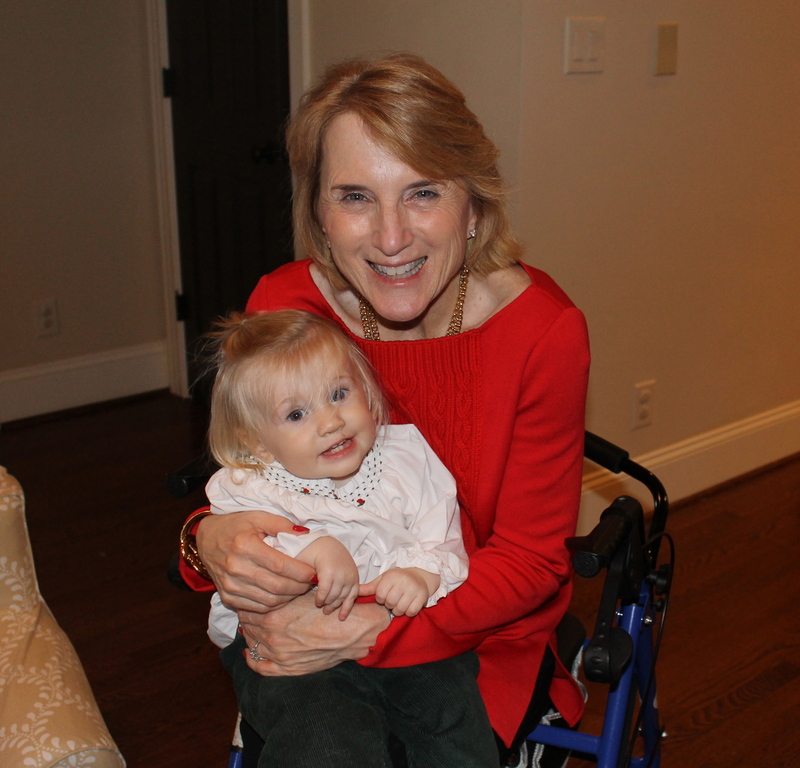 What I miss – My sister-in-law Colleen. She jut rolled into the United States from Germany. She spent the holidays with my husband’s family in New York. While she was there, they threw her a wedding shower. I hate that I missed it. I hate even more that I will miss her wedding. It’s less than 4 weeks from baby number two’s due date. 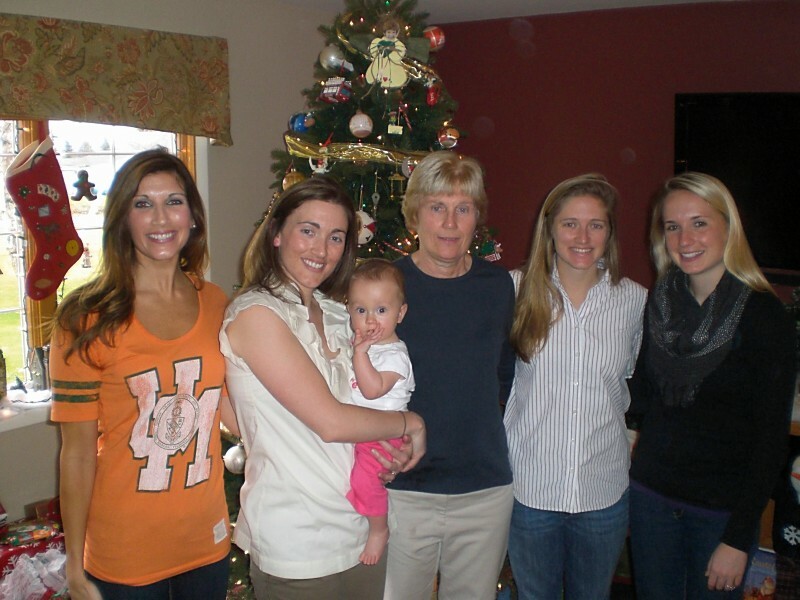 Christmas 2011 in New York with the Dufresne women. 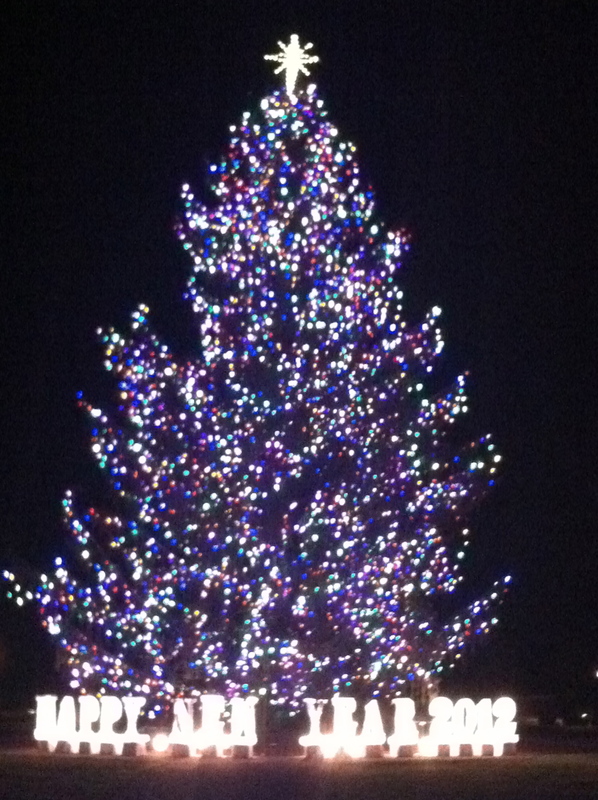 Best Moments this Week – Christmas of course! 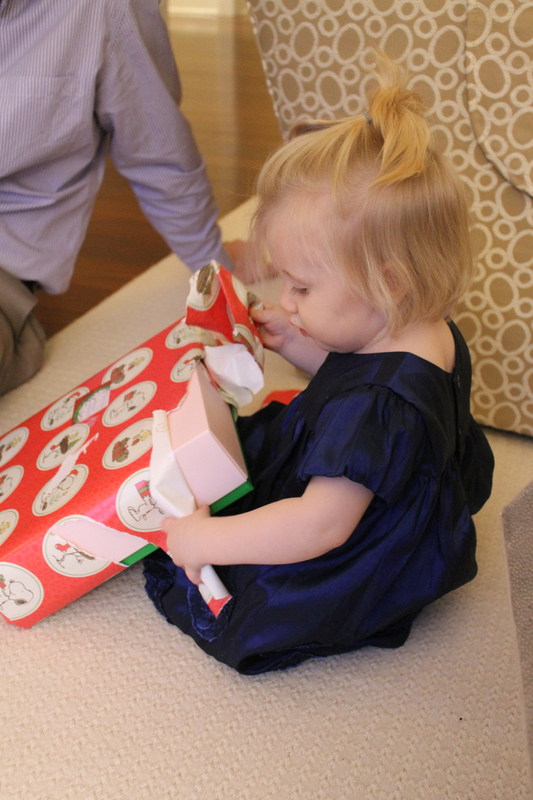 Did you see my post on baby’s second Christmas? It was great to have family in town. I am excited about having another child to enjoy the holiday with in the future. Looking forward to – A special New Year’s celebration. More details to be disclosed in next week’s update. Here is a sneak preview. Cravings – Sweets. Sweets. Sweets. Oh, and macaroni and cheese. Get it out of my house! Symptoms – Tired. Congested. Bleeding gums. Same old, same old. I hear that the first six years of your children’s lives are the most physically demanding on the parents. The years following are more mentally demanding. The grass is always greener. Workouts – Still going strong with teaching! I squeezed in three classes this week. I have to say that I thoroughly enjoy being on the bike still. I am still able to do what I am teaching the class to do. In fact, I have found that I am better off teaching because I am less competitive! Sometimes when I take class, I still find myself getting overly competitive. No need for that. With the holidays upon us, the torqboards were loaded. Love that! Wednesday – Tracy Anderson Pregnancy DVD. Thursday – Day off. It’s Christmas! 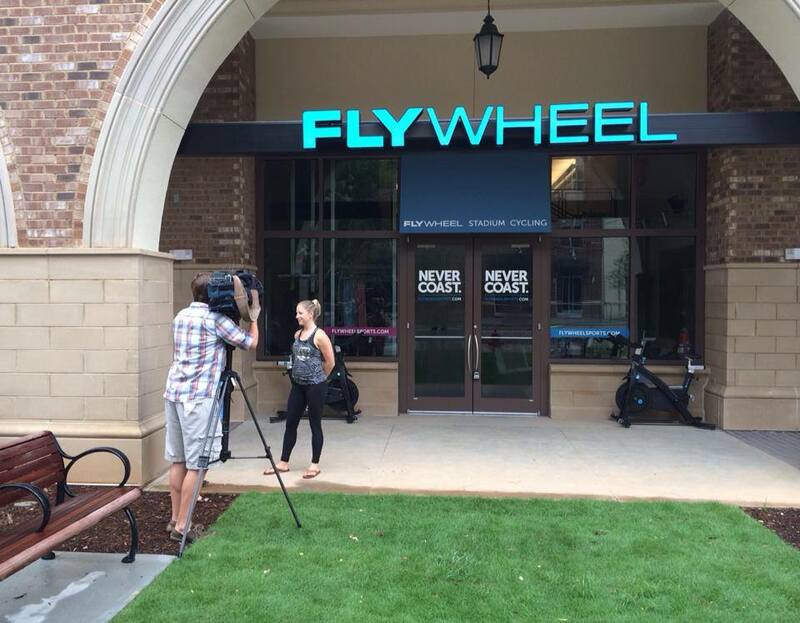 Friday – Teach Flywheel Charlotte. Saturday – Tracy Anderson Pregnancy DVD. 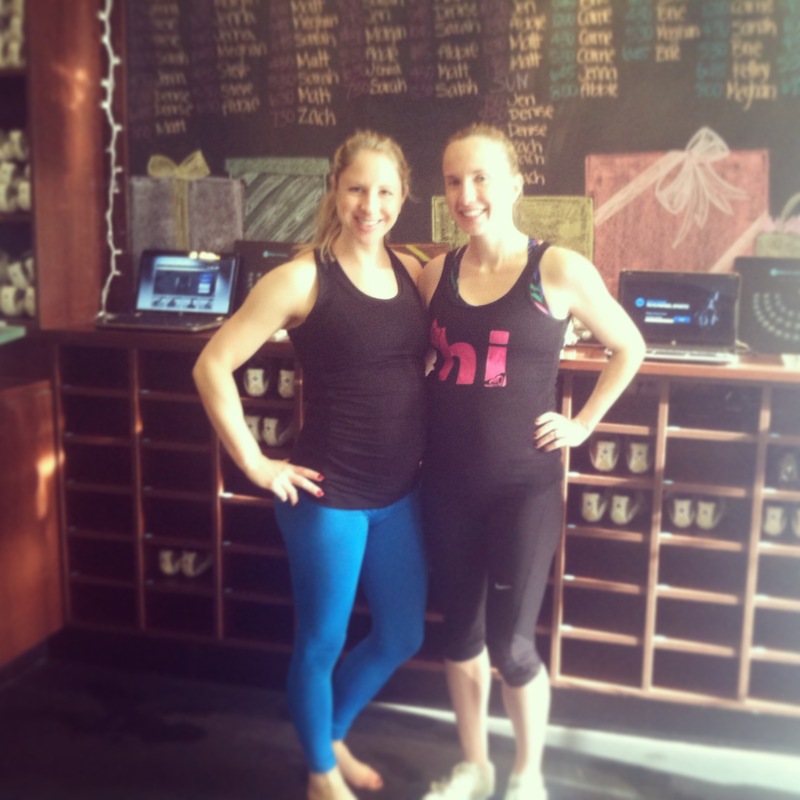 Sunday – Teach Flywheel Charlotte. A quick view of the playlist is below. So good to see so many familiar faces (and some new)! This entry was posted in Staying fit and tagged active pregnancy, fit pregnancy, pregnancy week 27 on December 29, 2014 by flyjenduf. I had no expectations of how the Christmas holiday would go with our fourteen month old this year. Last year, my daughter was only two months old when we celebrated the special holiday. Her Christmas consisted of lots of naps, breast milk and excitement over the large crowd that congregated at our recently renovated house. Our refrigerator died two days before the holiday. I scrambled to find a repairman/replacement by Christmas Eve, but I ended up with a mini fridge from Costco in my living room. We managed to fit most of the food for our family celebration in the mini fridge, but we did end up also filling a cooler on our back porch of what was left. The temperature allowed us to keep it there for almost three days following. To top all of that off, we found ourselves in the attic swapping buckets out from a leaking roof while our daughter slept gently in a pack n play in our room. 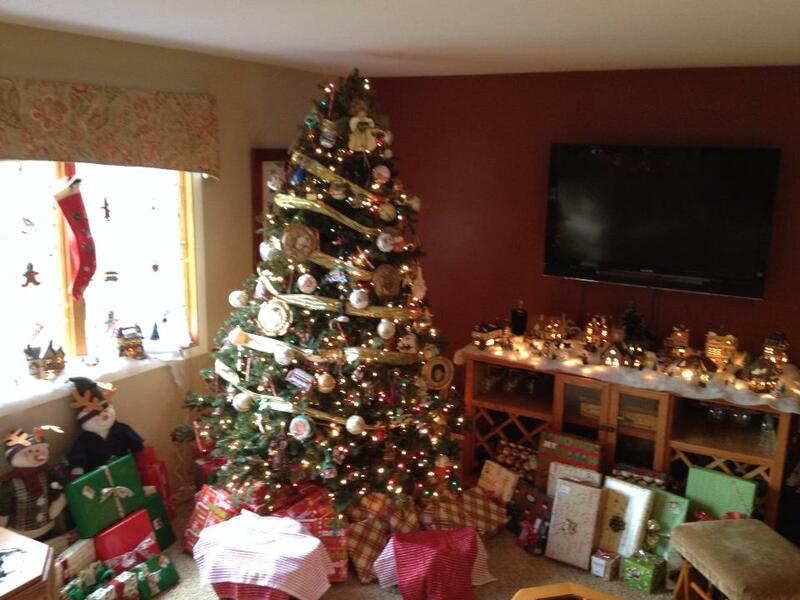 A good old fashioned Griswold Christmas. We made it through. Surely this year would be better? Surely. While we don’t go to church as much as we should, we got dressed up to make the trek out on Christmas Eve for the 4:00PM service at St. Gabes. Talk about romper room. We didn’t get there until 3:45. Our mistake. We ended up parking a quarter mile away before finding a small, steaming hot area in the back of the church to stand in. Yep. No seats left. We found ourselves in the midst of several other desperate families with children coloring, crying and running all over. There was no way that I was going to make it. Pregnant. In heels. Toddler in my arms. We did our best switching back and forth and “taking her for a walk”. By the gospel we had given up. We will reassess our plan next year (especially since we will have a nine month old in tow). From church, we headed to my parents house to have a Christmas Eve celebration. My daughter did great opening gifts. 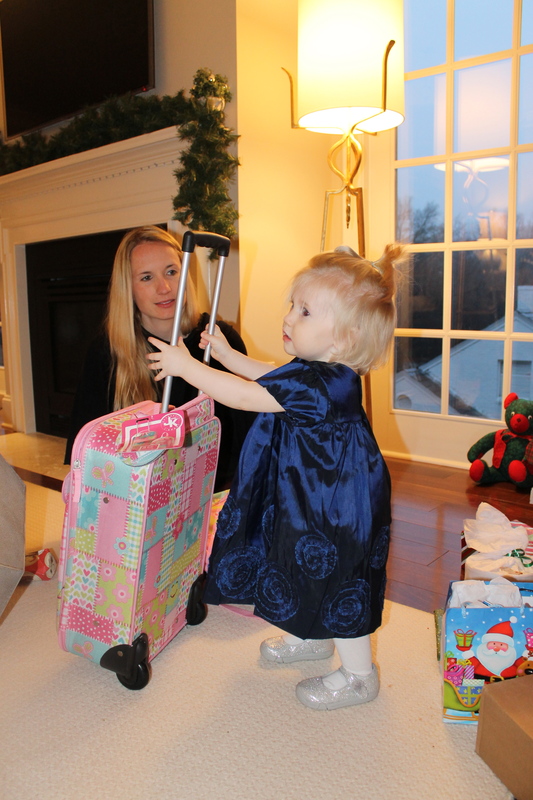 Her big gift from my parents was a wheelie suitcase. Something I had never thought about getting her but something she will use right away. She considered the bag a toy. I smiled as I imagined having my entire suitcase back when we go on trips. My daughter has her own space to put her things now! Great gift grandma. I have to say, one of her favorite parts of Christmas was finding excitement in popping the bubble wrap. Why does it always seem like she likes the things that hardly cost anything the most? After dinner, we snapped a quick family picture. 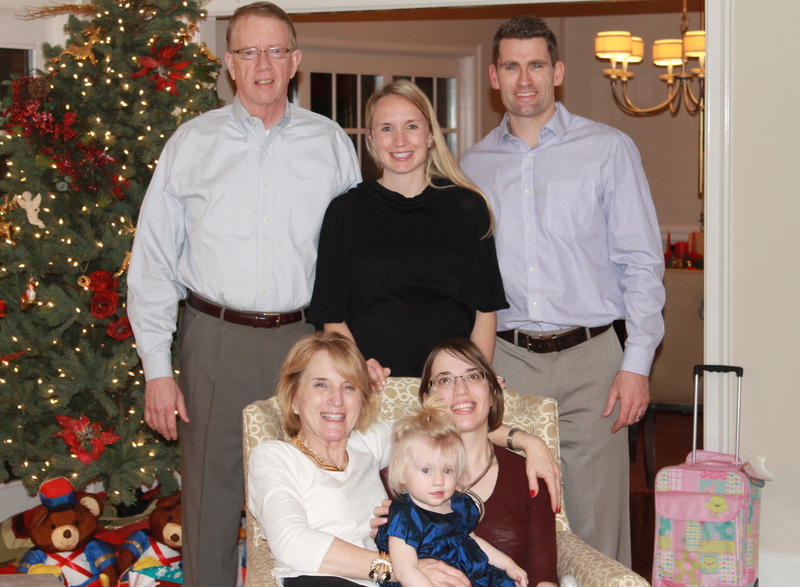 It was great to have my parents and sister in town to start the Christmas celebration. 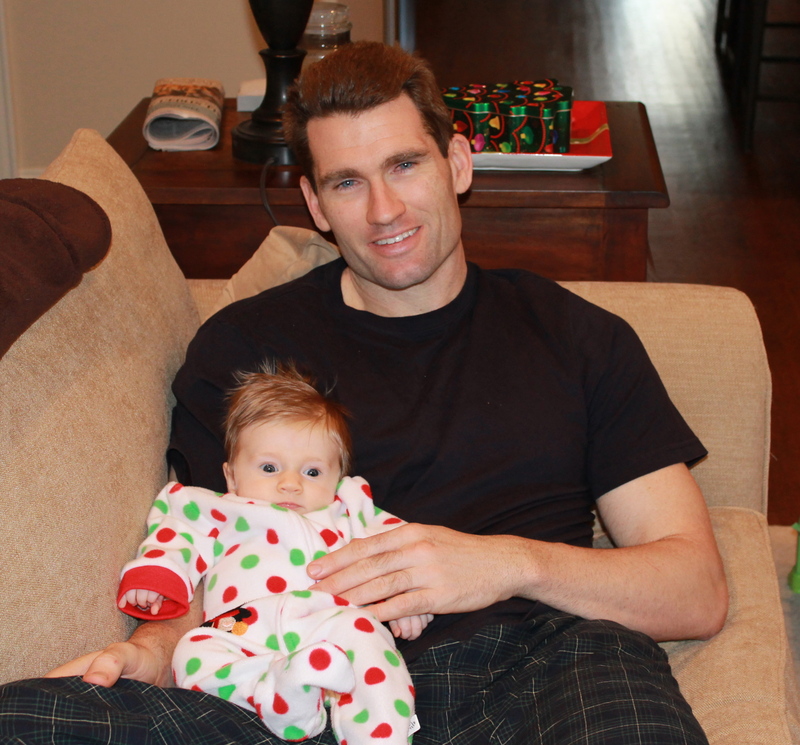 We headed home to get my daughter ready for bed before Santa came. This is a special holiday for my husband. His mom has been coined “Mrs. Claus”. 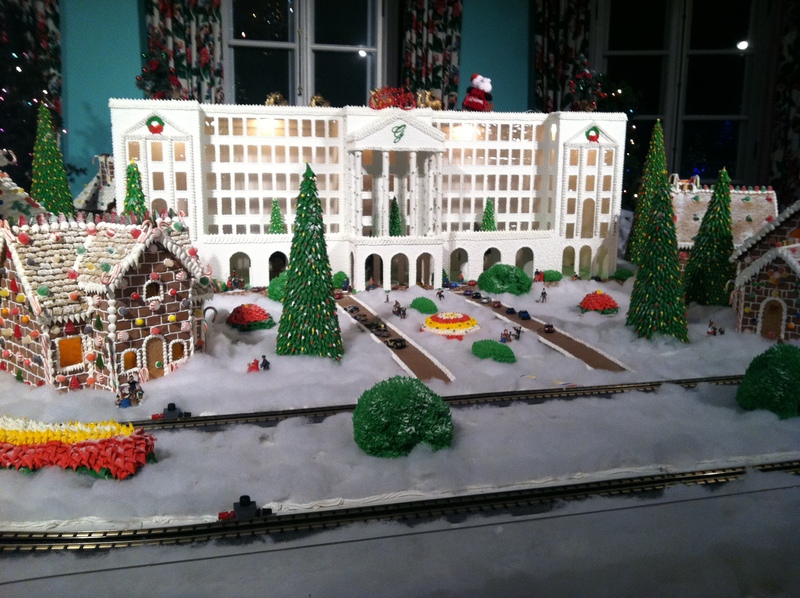 His house in New York is a winter wonderland during the month of December. It is almost impossible to recreate. That’s it below. I did my best this year. Santa sure did come. As my husband and I did one last pass of the living room before getting my daughter out of her bed, we glanced at the clock on the oven and noticed it was pitch black. At some point during the night the oven and microwave blew out. Of course. I had fifteen people coming over Christmas dinner. I had worried all night about how I would get all of the cooking done on time. All for nothing. Well, what do you do? It’s Christmas. Nothing will change. Two years ago, I would have had a meltdown. This year, I made up a new plan. Before we set that plan in motion, we had to get my daughter out of bed to see what her reaction would be. 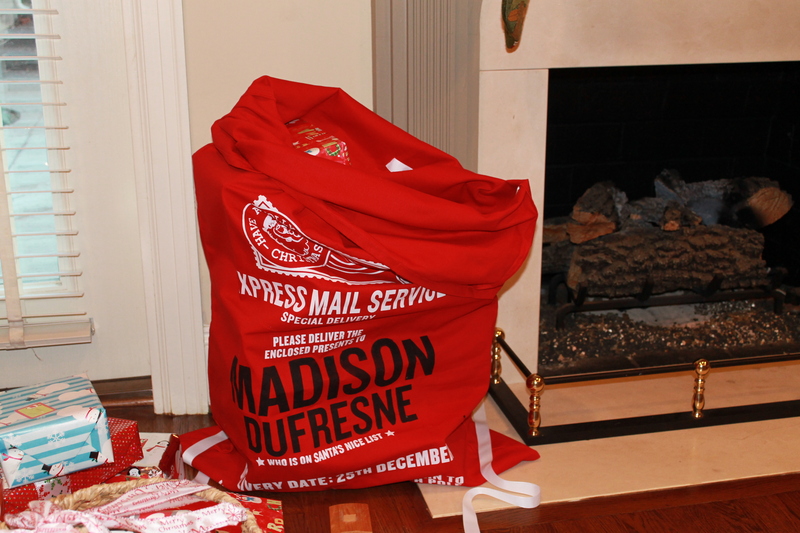 Santa packs my daughter’s presents in her own sack. Pretty fancy huh? He did it last year, and he did it again this year. Hopefully he can find another sack for baby number two next year! A toddler size baby stroller/baby/baby bottle – hopefully this is an indication that she will be mommy’s little helper soon. 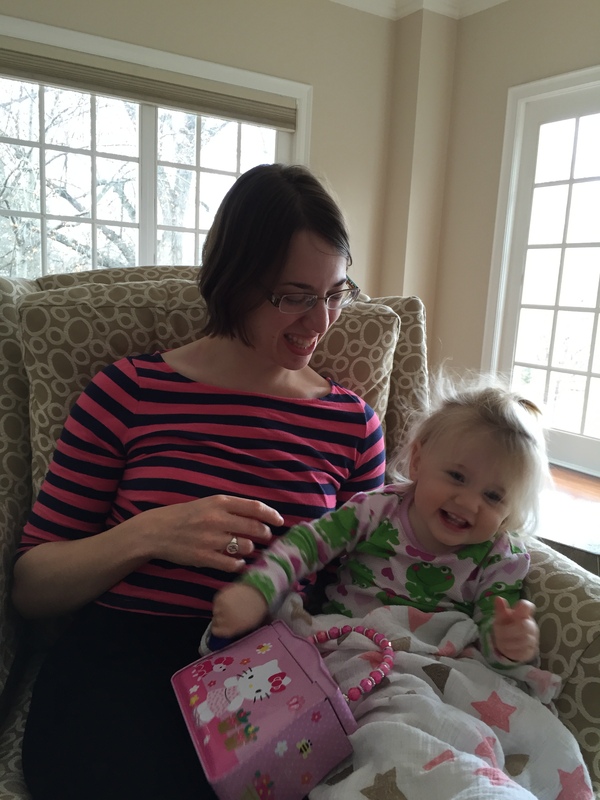 Books with Flaps – Anything that she can touch on the book to engage herself. 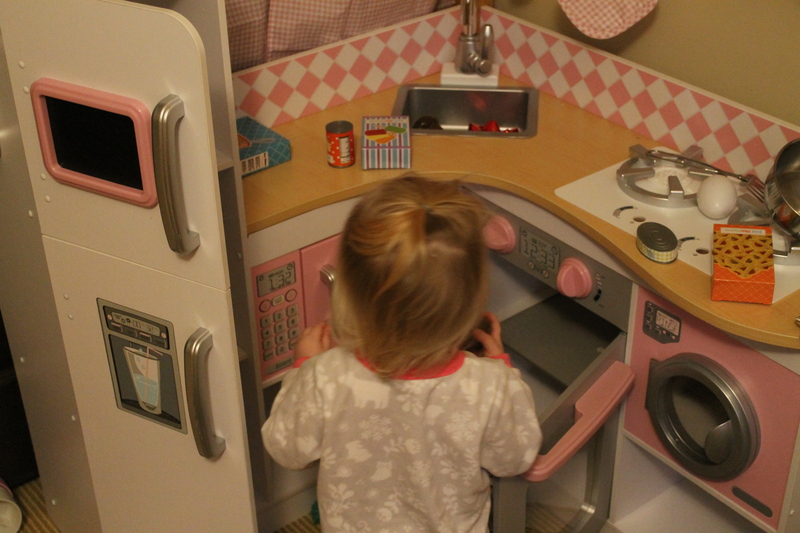 Last but not least – A kitchen. Don’t skimp here. It is worth the cost and labor to see how happy it will make your child. He or she will likely spend hours playing with this toy. With gifts out of the way, I was left with figuring out how we would eat the rest of the day. Thankfully, my parents live close. I packed up a pork roast and some stuffing and headed there. In three hours we would have the pork done. Just a tip – if you do not have another oven close by, you could always cook a roast on the grill or in a crock pot. 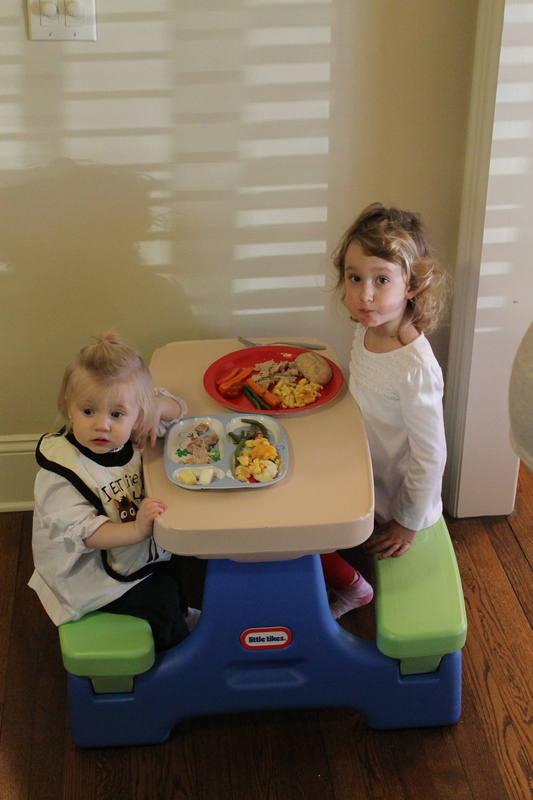 My daughter and her cousin sat at the kid’s table and enjoyed their dinner. I will do it again. 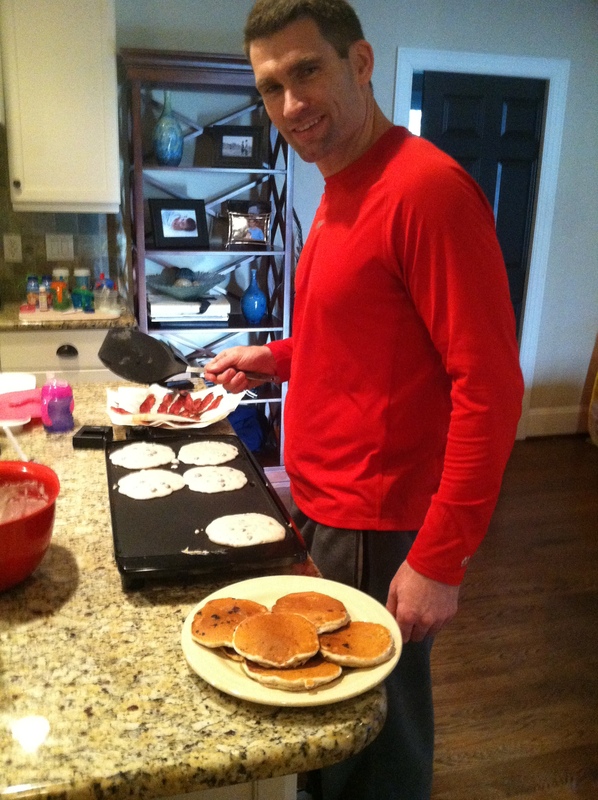 As much as I love cooking during the holidays, I love spending time with the people I care about more. To be honest, most people appreciate the effort just the same whether you outsource or do it yourself. Do yourself a favor. As we enjoyed dinner, we forgot about the minor kitchen disaster. In two years, we have had almost every major kitchen appliance die on us on Christmas Day. Both years we have managed without letting it ruin the day. 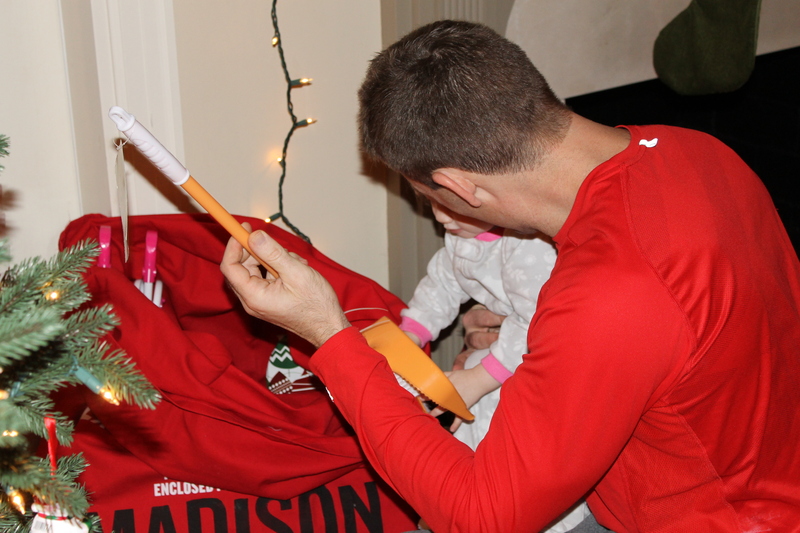 My daughter loved opening gifts, although she still doesn’t understand why she got them. She worked hard to carry as many of them around as she could (in fear that we might take them from her). She still wakes up in the morning and walks to the tree looking for more presents. Over the next year, she will figure it out. 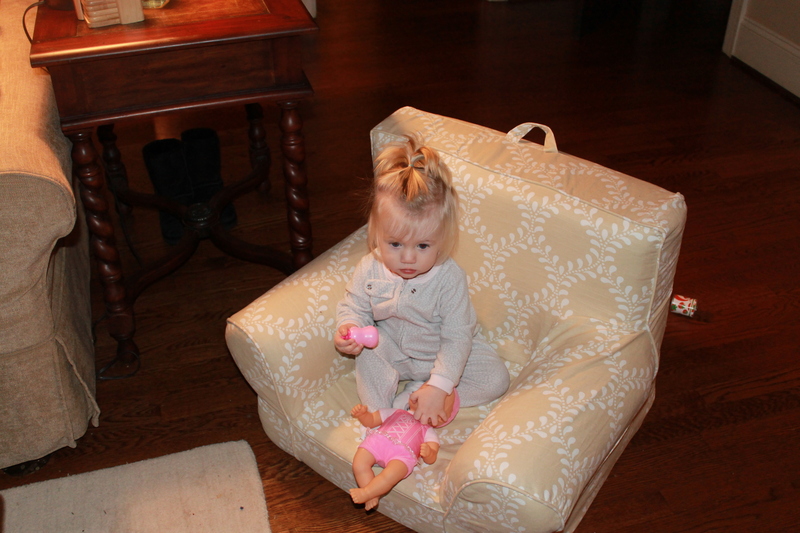 In the meantime, I’m going to work on developing mommy’s little helper with our new baby doll addition! This entry was posted in food and tagged 14 month old gifts, Christmas, Week 27 pregnancy on December 28, 2014 by flyjenduf. Size of Baby (per “What To Expect”) – Size of a turnip? If anyone eats those? Approximately 2 pounds. Weight Gain – After finally detoxing from the stomach flu, it appears that I officially gained no weight during the past week. Still holding steady at 15 pounds. As hard as I try to eat more food, I can’t seem to get back up in weight. I have a feeling that I will make a turn over the holidays. I see lots of good (and unhealthy) food in my future. Movement – Movement definitely picked up this week. 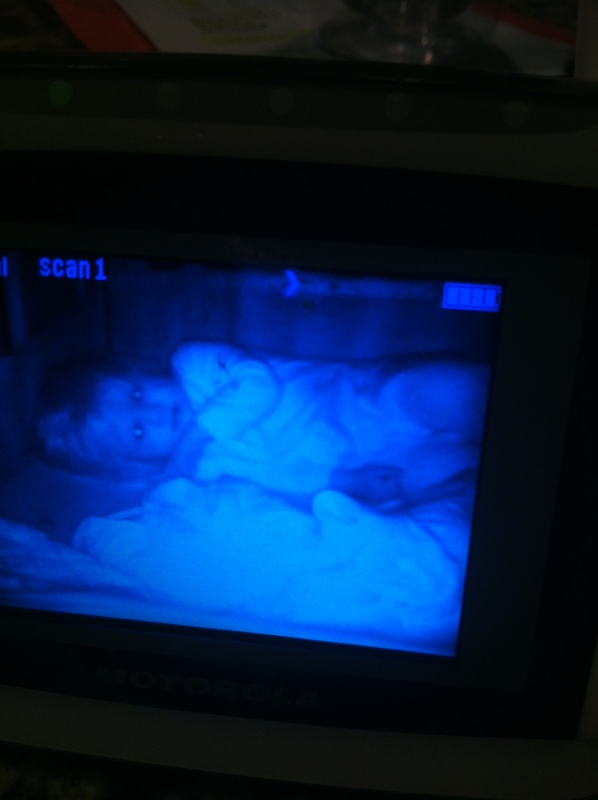 As far as movement when I exercise (a lot of people ask this) – the baby typically falls asleep. Almost immediately following, she is up and ready to go. Sleep – Could bad get any worse? My daughter has officially gotten on a schedule of waking up around 2:30 AM and not going back to bed for at least an hour. I have tried letting her cry it out. I have tried letting her co-sleep. Nothing works. Anyone have any advice? I sure could use the rest! What I miss – Geesh, sleep! Look at my little angel just staring innocently at me in the middle of the night. 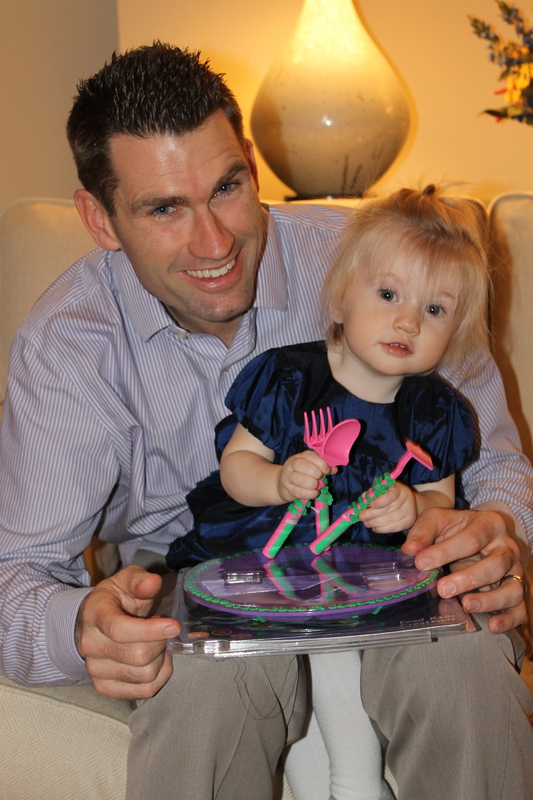 Best Moments this Week – Finishing up preparations for Christmas. It’s the most wonderful time of the year, right? 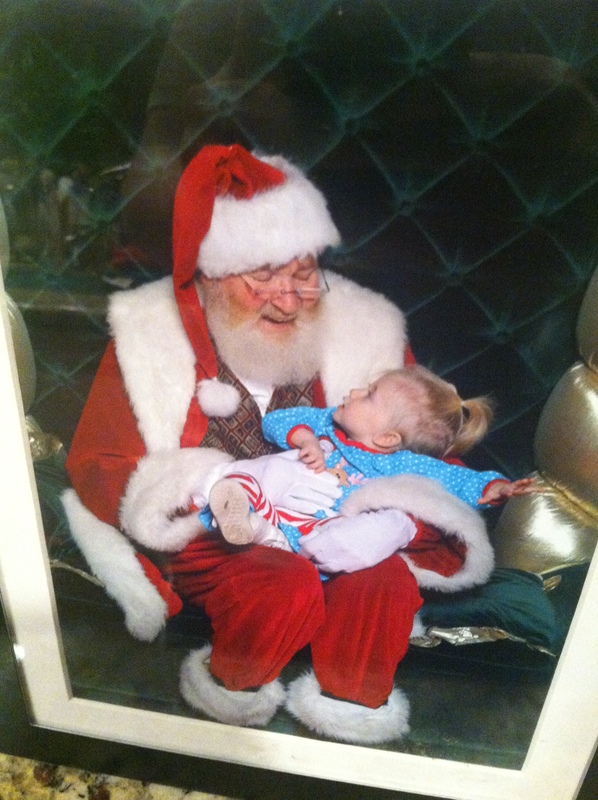 After a rough first introduction to Santa, my daughter did better our second go round. See pictures below. First try with Santa – wouldn’t even sit on his lap. 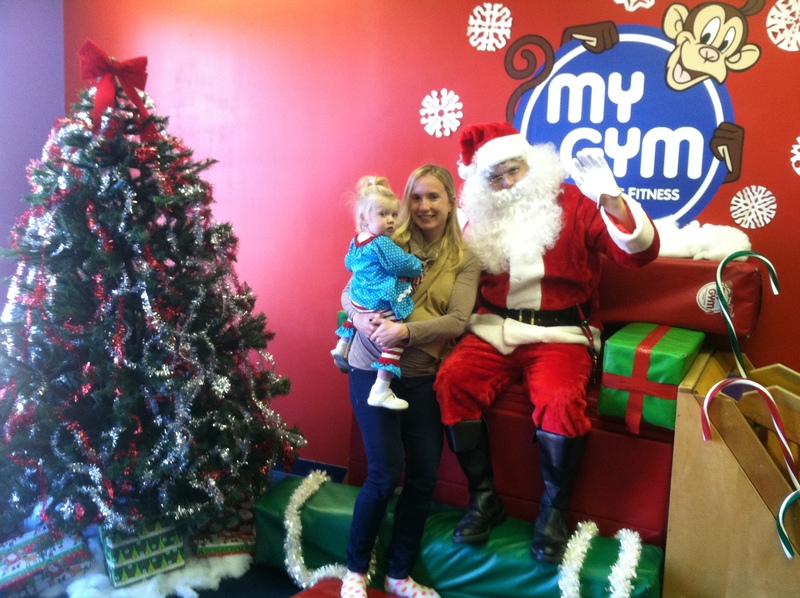 Second try with Santa – we made it on his lap! 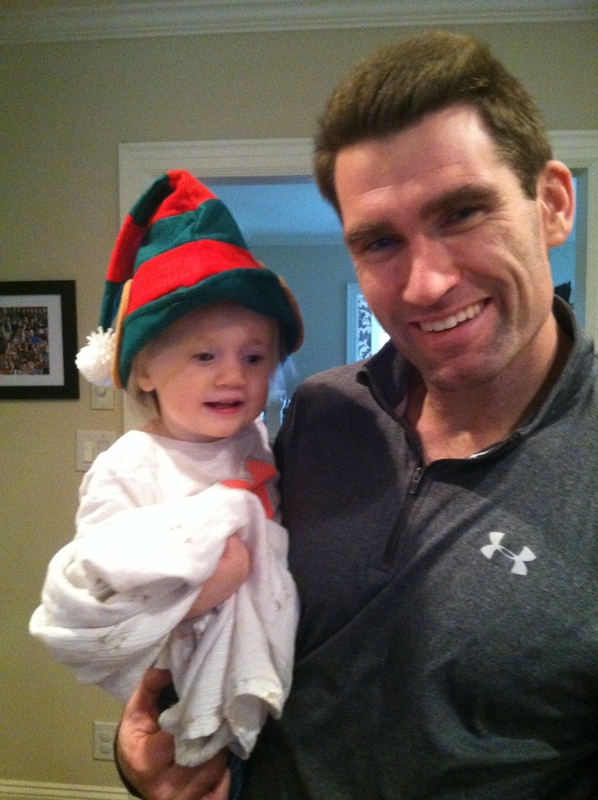 My little elf dressed the part while helping me finish one final round of baking and wrapping. 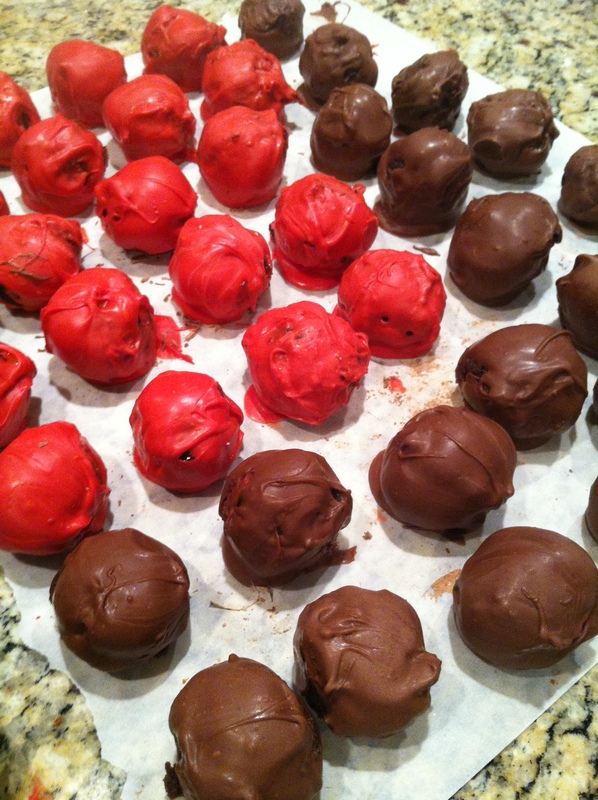 A family favorite of ours around the holidays is cake balls. I make these GIGANTIC! They are undeniably one of the most divine, unhealthy treats. Hence, why we make them once a year. Recipes are all over the internet. 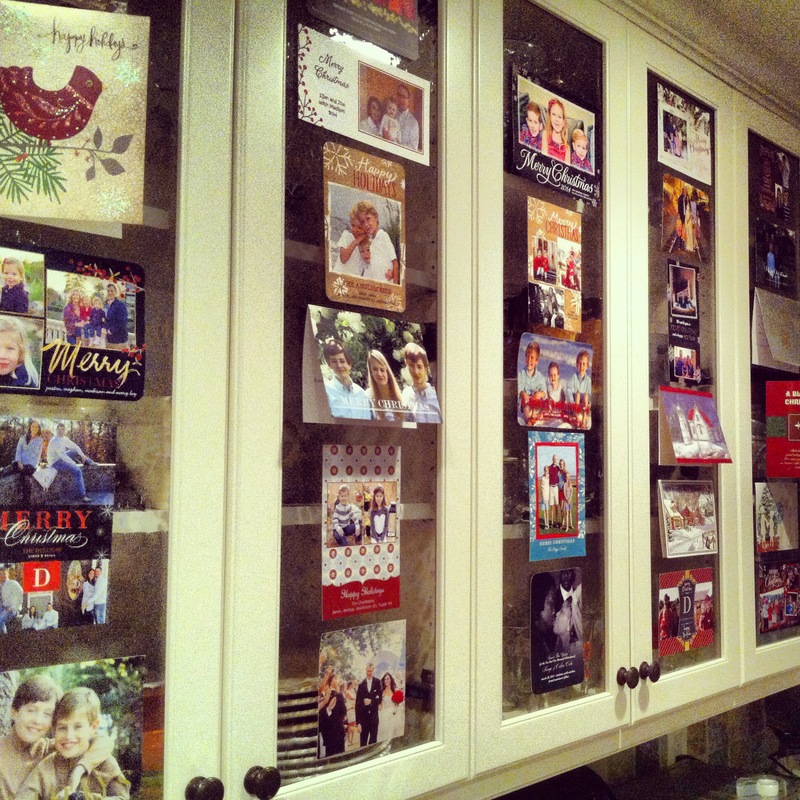 We display all of the Christmas cards that we receive on the face of the cabinets in our kitchen. It is a visual reminder of how lucky we are to have such amazing people in our lives. We will keep these up for weeks, if not months. I love seeing how much everyone has grown up over the year. My daughter also loves pointing at her friends and having me name family members. Finally, I have to finish my best moments of the week, with my doctor’s update for baby Duf 2.0. I had an appointment Tuesday. The doctor was not concerned about me having had the stomach flu since I was on the mend. My blood pressure was 100/70 and the baby’s heart rate was 152. Perfect ranges. I go back in the first week of January to get my glucose test done and meet with my doctor again. Before long, I will be going every two weeks! I’m going to try to convince them to let us get one more ultrasound. 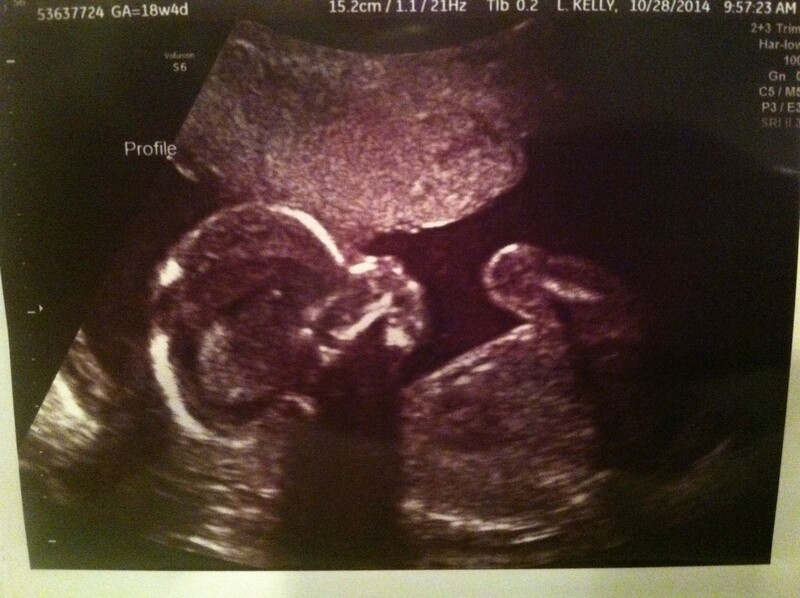 It has been almost 10 weeks since we saw this little one! Looking forward to – Lots of family time! My parents and sister are in Charlotte from now until after Christmas. I love that they are willing to celebrate the holiday with us. My daughter truly adores my sister. It is also nice to have a babysitter on call at most times of the day! Cravings – Everything. Since I got my appetite back from the stomach bug, I have been consuming an excessive amount of food. 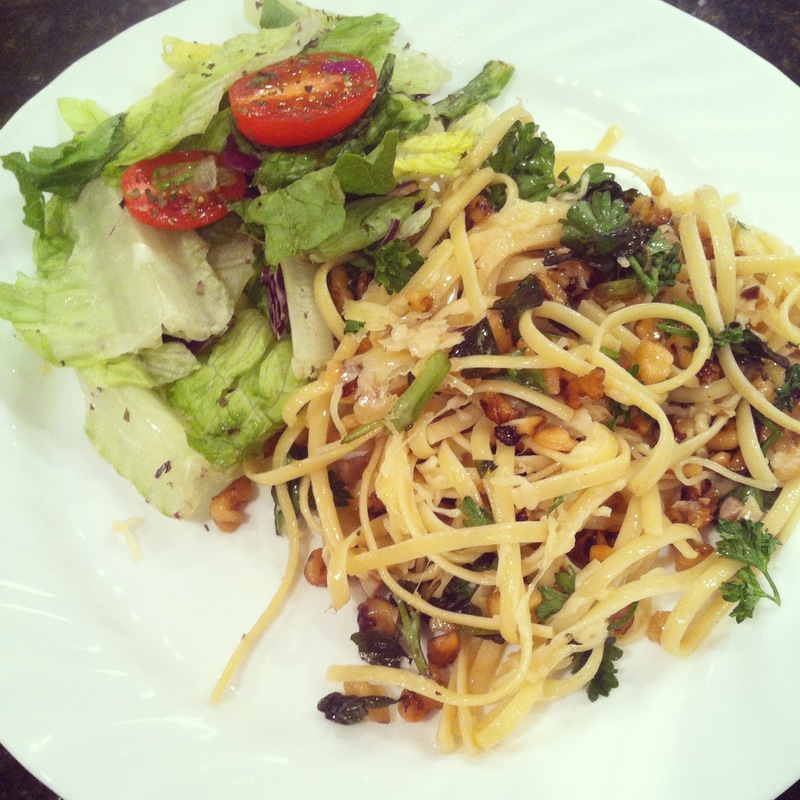 My mom made a classic vegetarian pasta dish for us for dinner on Sunday. Look out for the recipe this week. Healthy, yet melt in your mouth good. Symptoms – Tired. Did I say tired? Besides that, the big thing is restless legs syndrome. If you haven’t experienced this, it’s a tingly sensation in my toes that makes me feel like I need to move them. This usually just happens when I am laying down at night. This is also a symptom that I had last pregnancy. Workouts – I am officially done running. Not because of comfort, but because of time and other things going on. I am on the bike three-four days a week, which is all the scheduled cardio that I need at this point. I have trouble gaining weight as it is. The rest of my workouts involve weights and walking my daughter. 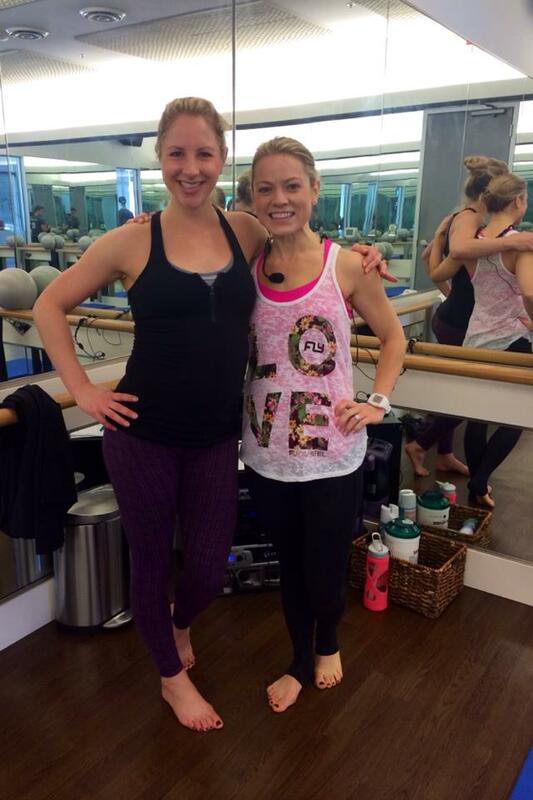 Thursday – Ride Flywheel Charlotte with Meghan Lee (pre-ride picture with pregnant barre instructor, Carrie, below). 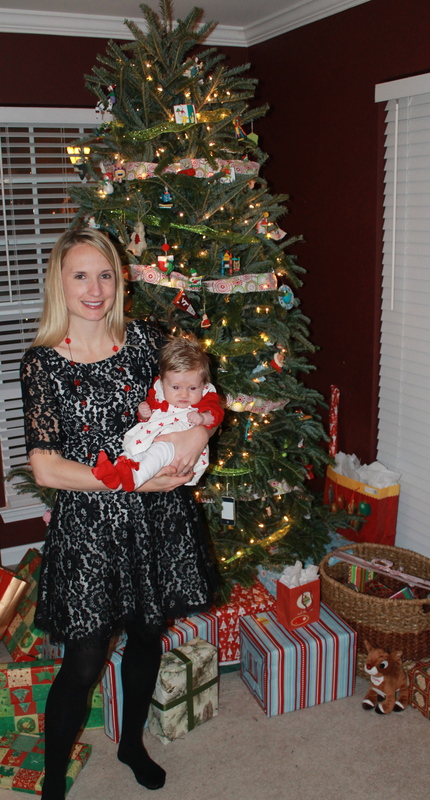 This entry was posted in Staying fit and tagged active pregnancy, charlotte, Christmas, fit pregnancy, flywheel, Pregnancy week 26 on December 23, 2014 by flyjenduf. 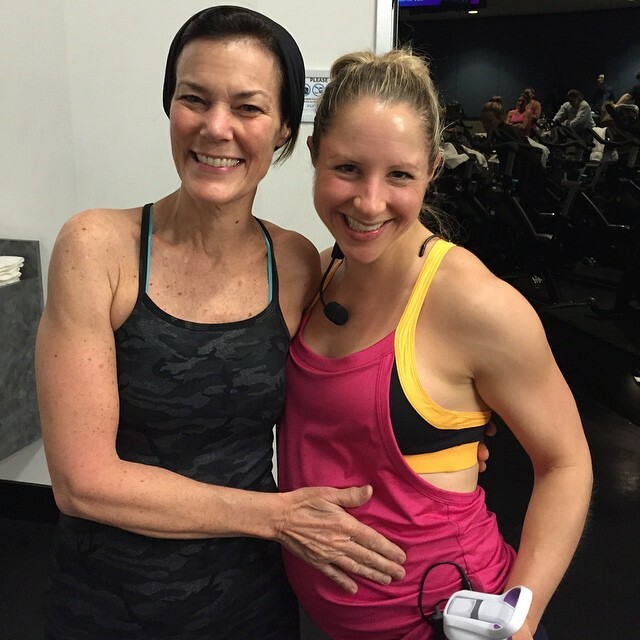 If you have been a regular fixture at the Flywheel Charlotte studio over the past three years, you would be crazy not to notice that several instructors and riders are working out while pregnant. I am currently teaching through my second pregnancy on the bike, which is totally low impact and safe for an entire pregnancy. What about barre though? Believe it or not, there have been more pregnant barre instructors at the studio in the past three years than wheel! 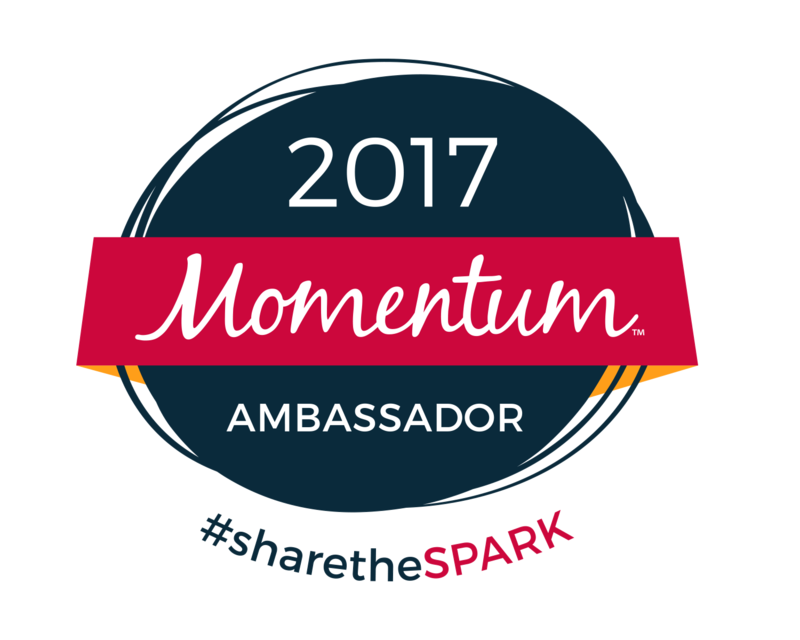 I love sharing my experience with someone else. Fortunately for me, Flybarre Master Instructor and Southeast Regional Training Lead, Carrie Kaschak, is also teaching through her pregnancy at my home studio. Carrie and I have known each other since the opening. In fact, she even recruited me to try out to teach cycle. It has been great to see her evolve throughout her role at the organization and to the point when she was ready to expand her family. When I asked Carrie if I could do a post on teaching barre pregnant, she obliged, and I have to say, I was very excited to dig into how she does it. First things first. This week, Carrie is in her 35th week of pregnancy. Um, you couldn’t tell. Where is that bump? Prior to becoming pregnant, she was teaching TWELVE classes a week on top of subbing classes when she needed to. In her 35th week, she is STILL teaching twelve classes a week. Important to know – her doctor has approved this. Interesting to know – through our chats about pregnant teaching, we learned that her doctor is the same doctor that delivered my first daughter! I think it is important to share this. It is in your best interest to find a doctor that understands your fitness abilities prior to being pregnant, so they can properly advise you while pregnant. In Carrie’s case, her doctor has been extremely supportive of her job. In fact, she thinks it will only help ease her labor and delivery. On top of teaching several classes a week, as part of Carrie’s regional role, she has assisted in the opening of three new studios and trained approximately twenty new instructors during her pregnancy. Check out the picture above at the Flywheel Raleigh opening. Although she is still on her routine, Carrie does know her limits (and discusses these with her doctor). See ways in which she has modified her routine as her baby has grown. Sorry, this is not an indication that class has changed. It means more than ever that she is keeping a watchful eye on participants! If you are not already impressed by this fit mom-to-be, let me tell you about how she has transformed her life outside of Flybarre during this pregnancy. During weeks 9-16, she took a daily one hour nap. She learned quickly that if she wanted to continue to teach 2 classes a day, she had to take a nap. 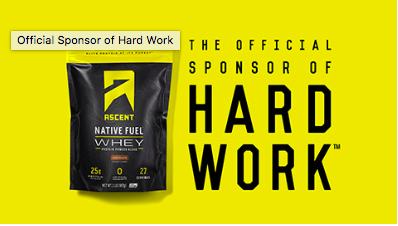 Continued to run – maxing out at approximately four miles most days. 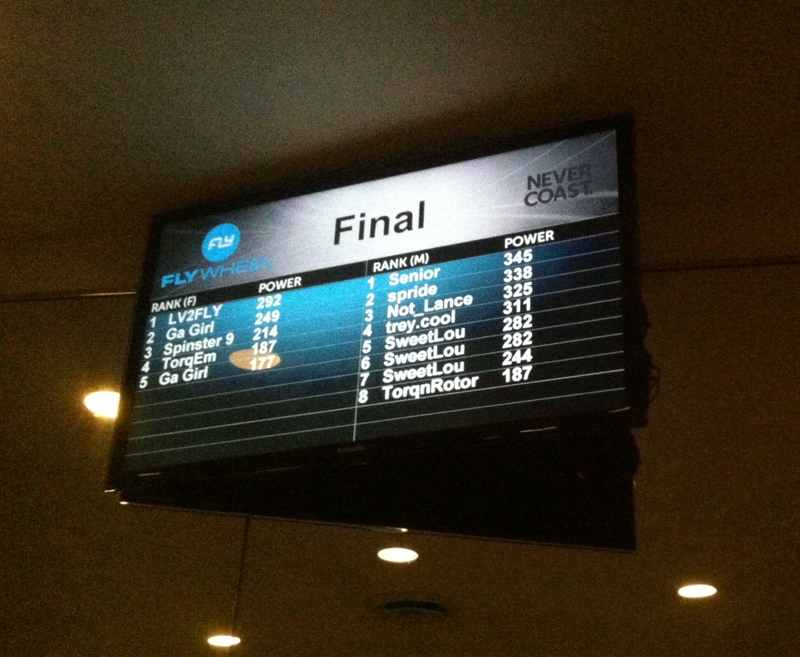 Continued to take a few weekly Flywheel cycle classes. Squeezed in time at the gym with her husband to lift some old fashioned weights. Opted to take several sessions at SmartCore Fitness with Denise Duffy. All of this variety has kept her motivated and relaxed throughout her pregnancy. Changes in blood sugar during exercise- eating a light snack before class helped her blood sugar from spiking. Her go to – clementines or almonds. Y’all this FlyMama is rocking out her first pregnancy in a way that most people are afraid to do. She is confident in her workouts, still rocks her spandex and has a special glow about her. Carrie and her husband are both very career driven, but in just chatting with her for a few minutes, you can tell she is ready for the next chapter of her life. Her excitement for all of the things that having a child brings is so genuine. Wish her well as she reaches that full term mark. 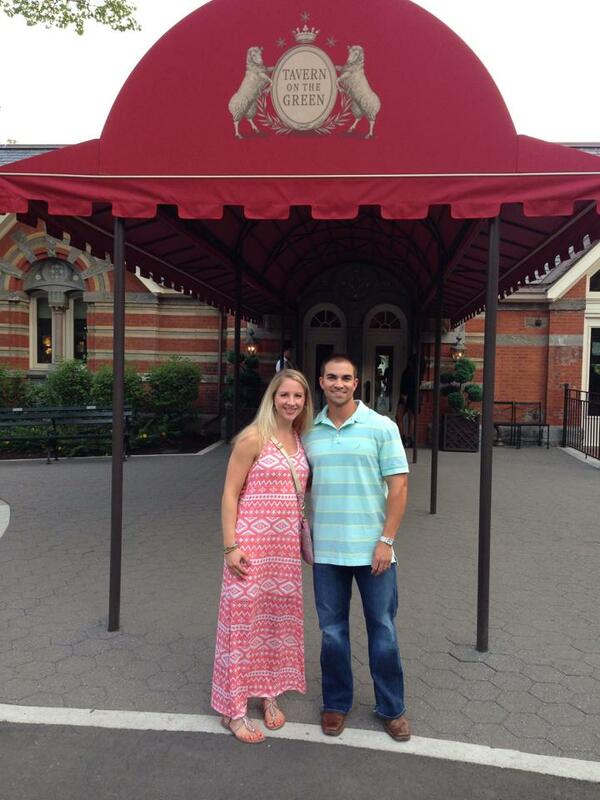 We can’t wait to meet her little one! 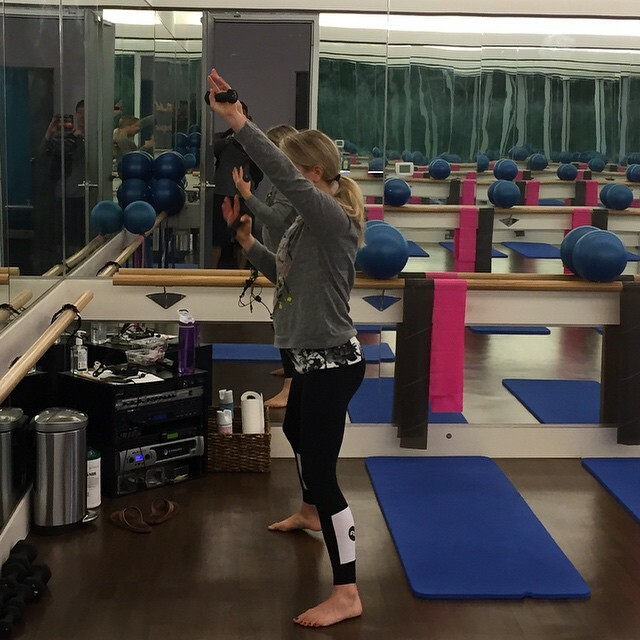 This entry was posted in Staying fit and tagged Carrie Kaschak, charlotte, fit pregnancy, FlyBarre, flywheel, teaching fitness class while pregnant on December 18, 2014 by flyjenduf.